I have some exciting news to share — I am about to embark on what I’ve been affectionately referring to as “Julie in DC: Part II”. This week, I am leaving Amplify Public Affairs and will soon be joining RADIUS, a corporate travel management company (TMC) serving multinational corporations with regional or global travel consolidation needs, as their Online Marketing Manager. I have learned a lot during my time at Amplify but am now looking forward to tackling this new challenge of developing and implementing a complete online marketing strategy for RADIUS. Additionally, this past weekend, I moved into the apartment of one of my closest friends from college, Mindy. I feel fortunate to be able to share my home with a friend and we have already had a lot of fun decorating and making plans for future hostessing opportunities. If you’d like to receive my new professional and personal contact information, just send me a quick note. I will be making the appropriate edits online in the coming weeks. Why they’re geek-worthy: By now every geek – and beyond – has an iPhone or similar smartphone. And although many may have forgotten since we haven’t yet pulled out the gloves this season, it’s impossible to use a touch screen while gloved. 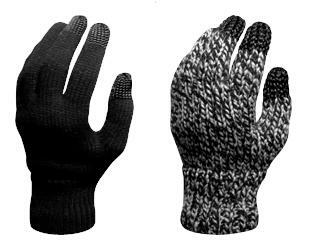 DOTS Gloves have the perfect solution – the fingers of the gloves have little balls of threads (I think that’s how it works, at least) that enable you to reclaim use of your phone during winter months. AND they keep you warm, to boot. The D105 (picture below on the left) are already sold out, giving an indication just how geektastic of a gift this is, but you can can snag the D110 (pictured below on the right) for $20, and the even more solid D200 for $25. If I have my history correct, DOTS Gloves were the first to create these types of gloves, making me like them even more, but since the D105 is sold out and the D110 is only available in Medium, I’d like to point you to a variety of other brands available on Amazon.